She and the girls walked down the endless stair way that spiraled downward, it was supposed to lead to the underground training area. But, Meathil truthfully had no idea what she was doing, they told her it was this way, but could she have taken a wrong turn somewhere? Because she couldn&apos;t see the end to the steps coming any time soon. "Meathil, I suggest we keep going, there has to be a point to the stairs, so we should find out what it is. It would be a good way to learn more about the castle," Othes suggested, she nodded still holding the torch high above her head as they headed down the long line of stairs. One after another, her feet stepped onto the stairs. They walked for another ten minutes and still there was no sign of the bottom, but they did pass some door on their way down. Maybe one of the doors was the room, and they had passed it already. Just as she was going to give up she heart the clashing of swords, they scraped up against one another making a horrid sharp noise. Then they came upon a light, blinding her for a few moments until finally seeing the room she had always yearned to see. The battle training room, where the fighters and captains would train every day. Her eyes gazed upon the room seeing a bunch of other brackets were already there, and already training. As she skimmed the room she saw a familiar face, Eglanor was standing by the long list of open training areas. He lifted his head and his eyes met hers, she saw them and smiled. He raised his hand and waved at her, she waved back and started to make her way over to him. "Hey, your lucky I got here early, I got you a good spot, area 27," he said and looked at her with a smile. "It even has a water station." He was such a geek, but she loved him anyways. As she walked down the rows of training areas she saw multiple brackets with 15 members some even with 20, they called those complete brackets. They passed almost all of them when she got to 25, it was her sister. She looked so mature, even though her sister was only 19 she was one of the top ranked captains. Meathil smiled and bowed her head slightly as she caught the eyes of the captain who did the same. "Who&apos;s that?" Pengeth asked impatiently, everyone looked at her. "That the Captain Camaeneth, the reaper" Deigil answered, quickly turning her head to face away from the captain. "That&apos;s the reaper! Meathil you know her?" Pengeth asked again. She sighed, every time anyone found out who her sister was she was always placed on a higher pedestal. "Yes, Captain Camaeneth is actually my older sister," she answered and kept on walking until they reached the area they had signed up for, or Eglanor had. He was right, it did have a water station. There was every type of weapon on the walls, from swords to scythes. The way she was taught to train was one on one, so she would take one person at a time, into the center of the area, and have everyone else stay against the walls. She wondered who would be the strongest, well considering Othes got the title of Vice Captain, maybe she was the strongest out of the group. She had no idea because some were built for other things than sword play. She would go by who ever she thought of first. 1...2...3... Deigil. Alright, Deigil was up first, she just needed to figure out which weapon the girl used. "Um, Deigil, I want to train you first, please choose a weapon." "Okay," the black haired girl slid over to the right wall to grab a large long sword off of the wall and held it tightly in her right hand. The blade was almost larger than her, yet she carried it with ease. At least Deigil was a swordsman, she herself could work with all sorts of weapons except for bows and arrows. Those things were the death of her when she was younger, she trained for hours, to not even hit the target. "I would like to use this one, I am skilled in sword play so maybe I will be okay against an opponent such as yourself." Deigil smirked and giggled. "Oh, don&apos;t get too cocky now. I&apos;ve still got some tricks up my sleeve," She said and with that made a sword appear out of thin air. One of her primary skills was being a mage, she knew how to switch out weapons, use healing magic, and all sorts of other stuff. It wasn&apos;t all violence all the time. The look on the warrior&apos;s face changed the minute she made the sword appear, she saw confusion, and fear. Immediately she took a quick step, turn, and pounce. She had been so quick no one knew she had moved from her previous spot, they all were still looking where she was. 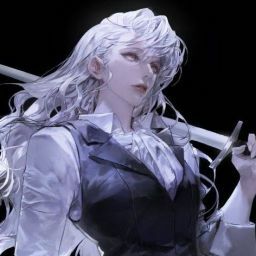 She held her sword high, at the neck of her dear bracket member, seeing the fear in Diegil&apos;s eyes as she made a quick stop so she wouldn&apos;t decapitate the girl. "Lesson number one, don&apos;t underestimate your opponent. Lesson number two, do not be afraid, fear is weakness, you are not weak. I see it in you Deigil, you just need to be confident that you can block the opponent, and you will, with no hesitation." She lowered her sword and let the girl catch her breath. "Now I know why they picked you to be a captain," Deigil murmured softly as she shifted her feet under the ground, in mere seconds she was neck and neck with Meathil. Their swords clashed together making that horrid screeching sound she hated. The girl moved swiftly but not fast enough so she couldn&apos;t see her. "But, still I&apos;m not going to back down." "Good, lesson three, give no mercy when cutting down your enemies." "No mercy, got it. Lets rumble Maethil," Deigil said with deep respect in her voice. She was ready to play by the rules and go full out, which made Meathil extremely proud. At least she would have accomplished something, one thing she could teach them all, fear is a weakness, and it needed to be crushed.